We’ve added a migration tool to Quform 2 to copy over existing forms, entries and settings from Quform 1.x into Quform 2. Both the Quform 1.x and Quform 2 plugins can be active on your site at the same time, so you can keep your existing forms running while transferring them one at a time over to Quform 2. Help! My forms are gone! If you updated the Quform plugin from version 1.x to 2.x using the WordPress update system (due to circumstances out of our control this is possible if the site is using the Avada theme or an Envato updater plugin), the forms will not be listed in the new version. You need to install the Quform version 1.10.0 plugin again (you can keep version 2 installed at the same time), if you need a download link to version 1.10.0 please send your purchase code and site URL to info@themecatcher.net and we’ll send you the link. Once you install Quform version 1.10.0 everything will be back to normal again. Then you can continue with the steps below when you are ready to migrate to Quform 2! It’s very important that you do not delete the Quform 1.x plugin (from within WordPress) before migrating or all forms and entries will be deleted from the database. We recommend just leaving the Quform 1.x plugin installed until you are completely happy with the migration to the new version, all data will still be available by activating the 1.x plugin at any time in the future, unless you delete the 1.x plugin from within WordPress. Backup the WordPress database, there are many plugins available for this. It’s always good to have a backup. Install the Quform 2 plugin (if you haven’t done so already), you can download it from your Downloads page on CodeCanyon. 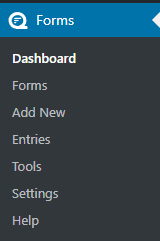 You can access the new plugin pages from the Forms top level menu. The old plugin pages can still be accessed from the Quform top level menu. Then, on the WordPress menu, go to Forms → Tools → Migrate. Select which forms and data you would like to migrate and click Start migration. Once completed, all the forms and data from Quform 1.x should be transferred to Quform 2. Go to the Forms page and make sure all forms have been converted properly, and click into some Entries to make sure all of the data is there. When you are happy with the migrated forms, you can start to change the form shortcodes and widgets over to use the new version. You can quickly grab the new form shortcodes from the Forms → Forms listing page. Note that the form ID number might be different from what it was in Quform 1.x, so double check you are replacing it with the same form. On the WordPress menu go to Forms → Settings and scroll down to the Locale option, and set a default locale (choose your country and language) then Save the settings. This option will determine the default date and time formats within the plugin and forms according to regional standards. Now would be a good time to review other settings on the page too. The email sending settings have been removed from the plugin. All emails are now sent using wp_mail() which opens up more possibilities for configuring email sending (for example OAuth) using other plugins. This means if you had configured Quform to send form data via SMTP, you will now need to install another plugin to make wp_mail() send email via SMTP. A popular plugin for this is WP Mail SMTP, for OAuth support you can use the Post SMTP plugin. Under the hood, all code that previously contained the word iphorm (the old name for the plugin) has been changed to quform, and some of the hooks and unique classes are different. See the custom coding migration guide. We can help you convert any code, feel free to ask for help on the forums or through the contact form on our CodeCanyon profile page.